The beautiful white sand beach at Hapuna stretches for over half a mile between the points of lava that form its boundaries. During the summer months, the beach is more than 200 feet wide-the widest white sand beach on the Big Island. High winter surf often erodes the beach considerably, but still leaves beachgoers more than enough sand for various activities. About midway along the beach, a lava promontory that was known to Hawaiian fishermen as Ihumoku (the "bow [of the] ship") crosses the sand and effectively divides the beach in half. To the south of this rocky point is Hapuna Beach State Recreation Area. Facilities in the beach park complex include half a dozen A-frame shelters that provide lodging for four persons in each shelter, paved parking lots, picnic pavilions, restrooms, showers, and paved walkways to the beach. The long, wide, flat white sand beach at Hapuna provides more than ample space for its many visitors. The beach slopes gently into the deeper offshore waters, where there are excellent opportunities for swimming, snorkeling, and nearshore scuba diving. A shallow, protected, sand-bottomed cove at the northern end of the beach is an ideal place for little children to play in the water. Professional diving instructors also use this area to introduce novice snorkelers and scuba divers to the ocean. At the southern end of the beach, enthusiastic swimmers have great fun jumping and diving into the ocean from several places in the sea cliffs. Plunging feet first into the water with the least possible splash was a popular ancient Hawaiian sport known as lelekawa. During the winter months, high surf often generates some excellent waves, particularly at the southern end of the beach, but state law permits only bodysurfing at Hapuna, thereby eliminating the serious conflicts that arise when board surfers compete with bodysurfers and swimmers for the same site. Fishing is good for both net and pole fishermen off the rocky points bordering the beach. Hapuna is in the driest area of the entire Big Island (on the average less than 10 inches of rainfall a year). Sunbathers, therefore, can expect more sunny days here than at any other shoreline site on the island. 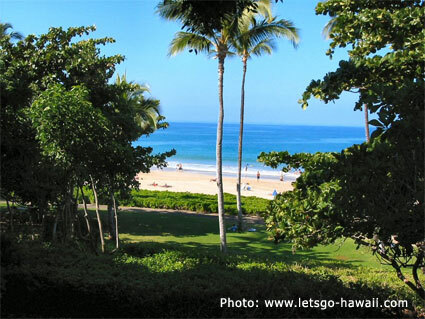 The combination of ample, well-maintained public facilities, excellent beach conditions, and the wide range of possible shoreline activities have made Hapuna Beach State Recreation Area the most popular and widely visited beach park on the Big Island. Visitors and residents often travel many miles, from as far away as the Hilo and Puna districts, particularly on weekends and holidays, to spend the day at Hapuna. The large numbers of beachgoers pose no problems during the summer months when the ocean is calm, but during the winter months, usually from October through April, there are very serious water safety problems. High surf strikes the beach, generating a pounding shorebreak and extremely powerful, shifting rip currents. Many individuals, particularly out-of-state visitors unfamiliar with Hawaiian waters, attempt to swim or bodysurf during such hazardous conditions and find themselves unable to cope. Some even lose their lives. Hapuna Beach has full time year round professional lifeguard coverage. Swimmers unfamiliar with the beach and the hazards of Hawaiian surf would be well advised to stay out of the water completely during periods of rough or high seas. Do no take a chance and become one of the annual drowning statistics. Other hazards in area include Portuguese man-of-war and other jellyfish that blow inshore during .storms. Powerful winds, particularly common in the months of January, February, and March, can also pose a danger carrying inflatable rafts and people on them out to sea. During the calm summer months, Hapuna Beach State Recreation Area is the site of the Big Island's Rough Water Swim, an annual event since 1979. The roughly circular course of 1.1 miles utilizes the entire width of the bay from point to point, and attracts many participants. When the Territory of Hawaiʻi first opened Hapuna Beach as a public park, it did not have title to a large triangular portion of the park property immediately south of Ihumoku, the rock promontory that divides the beach. This section of land, part of the land division of ʻOuli owned by the Parker Ranch, was subsequently acquired through the cooperation of Alfred Wellington Carter, the manager of the Parker Ranch from 1899 to 1937. In recognition of his assistance the park was named A.W. Carter Beach Park, but this name was eventually changed in favor of Hapuna Beach State Recreation Area when the property was developed and improved with public facilities.